My preserved lemon radar has been at its peak since Margaux made the Moroccan Chicken and Carrots, and we posted the recipe for preserved lemon. I have a hunch that the recipes featuring this tasty Moroccan ingredient will start pouring into our blog since we both love it and have it on our minds. I was browsing through the many cooking magazines that have piled up and saw this recipe in Food & Wine by Paula Wolfert. She is a recognized authority on Mediterranean cooking who brought Morccan cuisine to the general public’s attention all the way back in 1973 with her cookbook, Couscous and Other Good Food from Morocco. I was delighted when I went to buy shrimp at Whole Foods and it was on sale. One of life’s little treats is when the very thing you came to buy is on sale! Randy and I both loved this dish and it paired perfectly with the “robust rose” from Spain that was recommended. Randy helped me cook and said to make sure that I told you all to be sure and have a sous chef when you are making this dish. It is not difficult at all but requires a lot of chopping – thank you, Randy! Whisk the lemon juice, paprika, ginger, saffron and olive oil together. 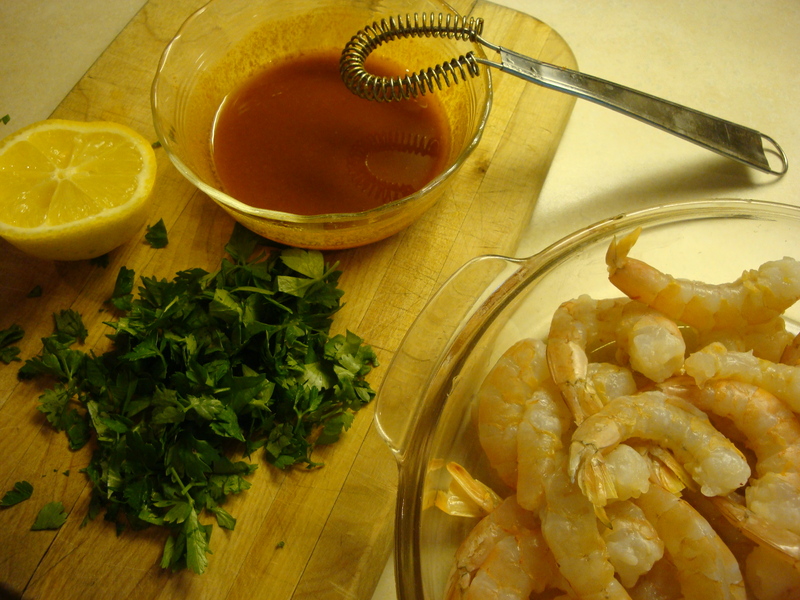 Sprinkle the herbs and pour the marinade over the shrimp and stir to blend. Cover and refrigerate for 2 hours. Place these ingredients into a saucepan. 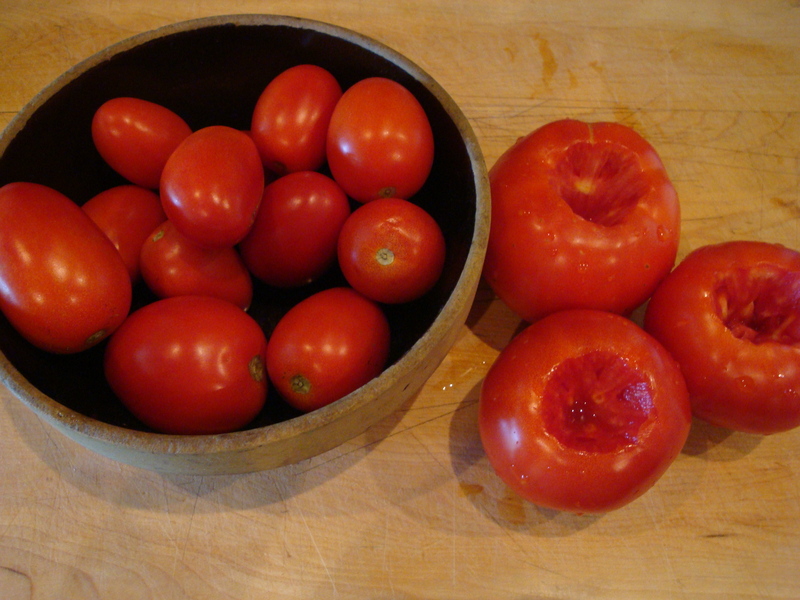 Bring to a bubble and simmer for 10-15 minutes until the tomatoes break down and the sauce starts to thicken. Set aside. Place the sliced ingredients in a dutch oven (or a tagine if you are lucky enough to have one!) in layers in the order listed. After each layer, add a little salt and pepper. In case you’re wondering what those dark things are in the photo with the peppers, I bought a package of tiny red, yellow and purple bell peppers and used those. 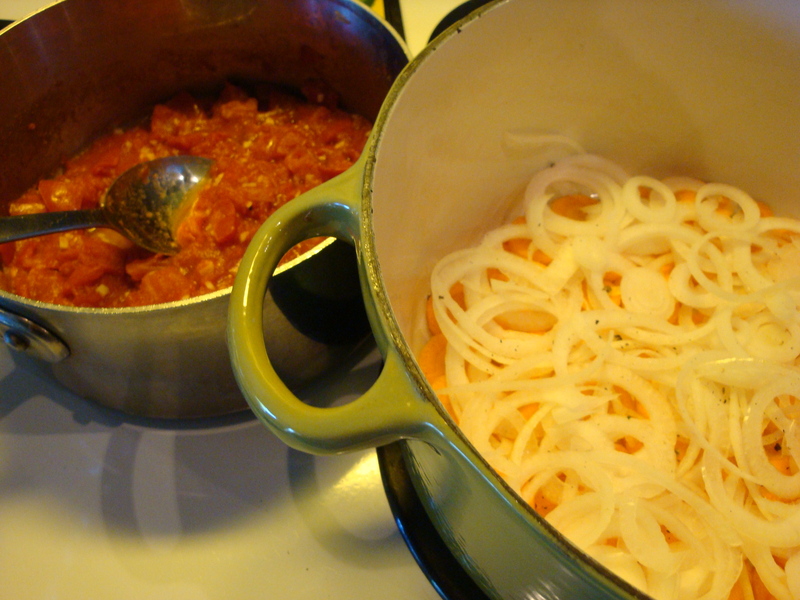 Pour the tomato sauce on top of the layered vegetables and push down a little with a spoon. Turn heat to medium high to get the juices bubbling. 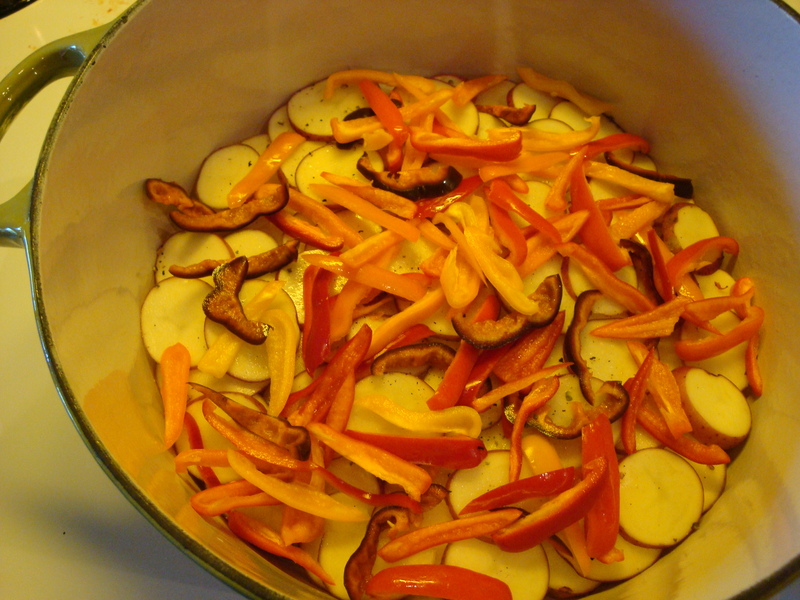 Turn down heat to medium low and cook for 20-25 minutes, until all vegetables are cooked. Check occasionally so the vegetables on the bottom don’t burn. I was nervous about how the dish looked while it was cooking, but it all turned out in the end, so don’t worry if it doesn’t look like it’s going to come together. 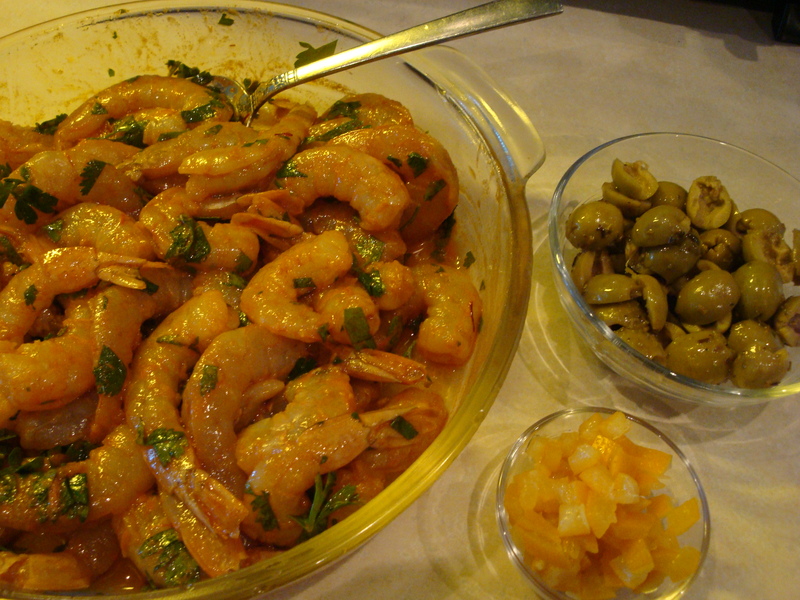 When vegetables are cooked through, add the preserved lemon, olives and the marinated shrimp. Cook about 5 minutes until the shrimp is just pink and curled. 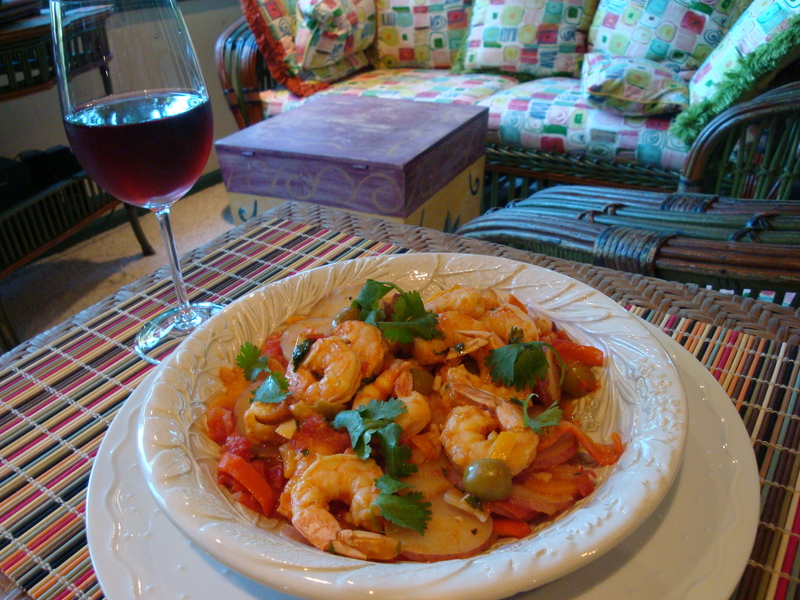 Remove the shrimp from the pot and set aside. Stir the vegetables and turn the heat up a little to cook off excess liquid. Be careful not to burn the bottom of the pot, although Randy and I agreed that we liked the bits of carrot and potato that carmelized a little while doing this. 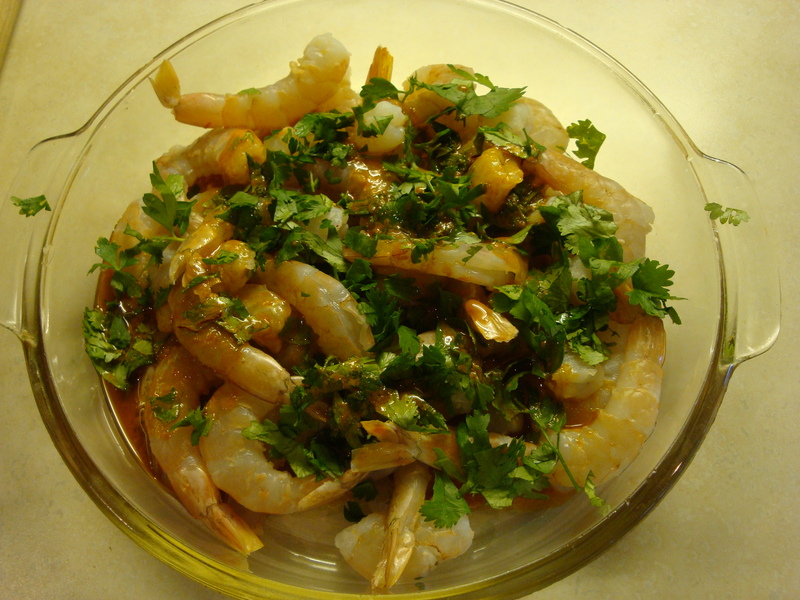 Transfer the vegetables to a serving bowl or individual serving bowls and top with the shrimp and a few cilantro (or parsley) leaves for garnish.